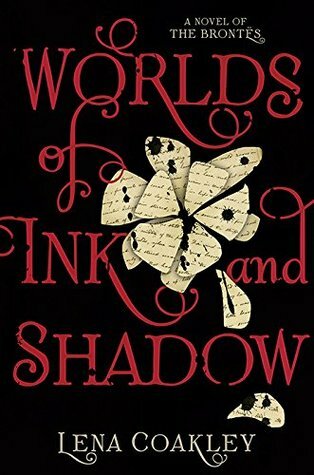 Presenting World of Ink and Shadow by Lena Coakley. Charlotte, Branwell, Emily, and Anne. The Brontë siblings have always been close. After all, nothing can unite four siblings quite like life in an isolated parsonage on the moors. Their vivid imaginations lend them escape from their strict, spartan upbringing, actually transporting them into their created worlds: the glittering Verdopolis and the romantic and melancholy Gondal. But at what price? As Branwell begins to slip into madness and the sisters feel their real lives slipping away, they must weigh the cost of their powerful imaginations, even as their characters—the brooding Rogue and dashing Duke of Zamorna—refuse to let them go. This richly conceived, haunting fantasy draws on the early writings of this most famous literary family to explore the deathless bonds between sisters and brothers, between writers and their creations. About the Brontes and of the Brontes. Lena Coakley tells of the siblings before they wrote their famous stories - Jane Eyre, Wuthering Heights, The Tenants of Wildfell Hall and many more (with a twist). An original concept with tinges of fantasy. Before everything there was Verdopolis and Gondal and the siblings in the throughs of enchantment opening doorways to their fictional worlds by their co-written words. But as always magic has a cost. The story as I stated carries an original concept mixed with history ...... but there in lies the problem which might not make sense to someone not privy to the history of the Brontes. So if you are interested in jumping into the story I suggest you all research their lives before you begin. The story would largely make much more sense then and you won't be so lost as you might have been otherwise. Its in essence much more about the lush and opulent Verdoplis and the cut-throat land of Gondal than the siblings' life themselves. I would have loved it more if it was a bit about both. The story reads well and its not bad at all but that's just it, nothing eventful happens and the way they escape the call of their fictional world's didn't really gather much notion ...... Do I recommend the book? I'd say try but don't expect much. You just might like it better. "History mixed with the paranormal. A good try but the idea fails to be flourish"
Thanks . I liked her debut. I'm not sure if that will be case w/ this one. I think i'll borrow it at the library.